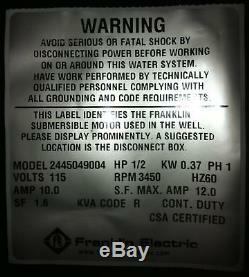 FRANKLIN ELECTRIC 4" 2-WIRE SUBMERSIBLE WELL PUMP MOTOR (This is just the motor not a complete pump) (for use without control box, if you have a control box you can eliminate it using this motor) Fits Most 1/2 Horse 4" Pump Ends! Specs: Model: 2445049004 1/2 Horsepower 0.37 KW 115 Volts (We also have 230 Volts see our store) 3450 RPM's 60 HZ 10 Amps 12 S.
1.6 KVA Code R Continuous Duty Thermally Protected Equipped with Lightning Arrestors. Comes with factory installed 4 ft. The item "Franklin 1/2 HP. 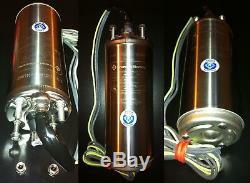 5 Submersible Well Pump Motor 115v NEW" is in sale since Wednesday, June 9, 2010. This item is in the category "Home & Garden\Home Improvement\Plumbing & Fixtures\Pumps". The seller is "hhpac" and is located in Alliance, Ohio. This item can be shipped to United States.